Why Scala for CS1 and CS2? Welcome to the website for the Introduction to Scala series of books for CS1, CS2, and Data Structures. 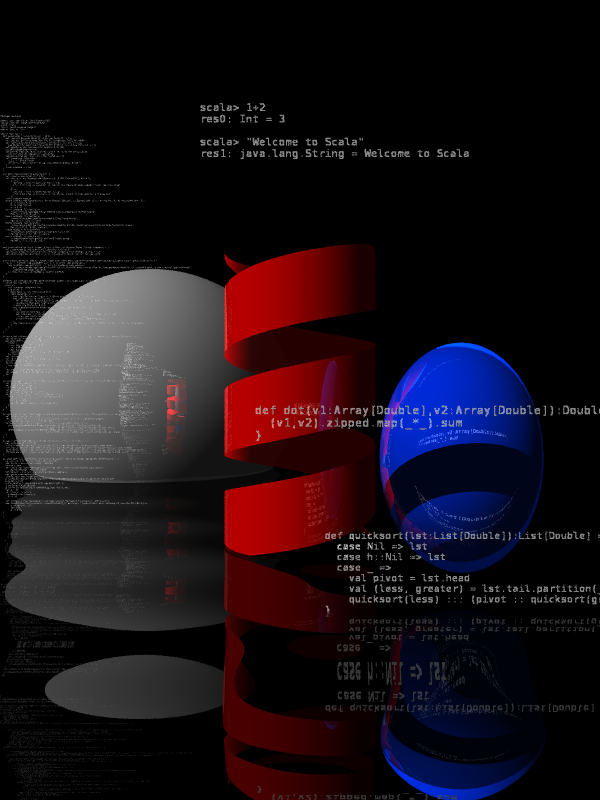 The cover images are ray traced images created with a ray tracer that the authors wrote in Scala as an initial Scala project. If you click the image on each of the book pages, you will get a full sized version. All the features used to make these images are within the scope of an engaged student by the time the CS2 material in an edition of the books has been completed. Subpages (6): Errata Introduction to Programming and Problem Solving Using Scala - 2nd Edition Introduction to the Art of Programming Using Scala - 1st Edition Object-Orientation, Abstract, and Data Structures Using Scala - 2nd Edition Quick Overview of Scala Why Scala for CS1 and CS2?